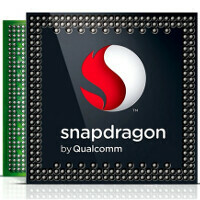 Qualcomm Snapdragon 815 chipset to feature Quad Cortex A72 and Quad Cortex A53 cores? Details about the unreleased Qualcomm Snapdragon 815 have been leaked by a source and published in a new report on Sunday. According to this tipster, the Snapdragon 815 will feature four Cortex A72 cores and four Cortex A53 cores. That means that the chip will use the big.LITTLE architecture with one set of four cores in use at one time. The Cortex A72 cores will handle the heavy lifting while the Cortex A53 cores will take care of the light housekeeping. According to the source, Qualcomm might "tweak" the cores. The chipset will employ the next-gen Adreno GPU which is expected to be the Adreno 450, and will be built using the FinFet process. Earlier this year, an alleged Qualcomm roadmap revealed that the Snapdragon 815 SoC would include LDDR4 RAM and use the MDM9X55 LTE-A Cat.10 modem. If you're worried about the Snapdragon 815 overheating like the Snapdragon 810 originally did, it looks like Qualcomm has solved this issue. A recent test conducted internally by Qualcomm shows that the Snapdragon 815 runs cooler than both the Qualcomm 810 and Qualcomm 801 chipsets. By the way, if you're wondering why the Snapdragon 815 has yet to be released by Qualcomm, it's because the latter wants to ring up as many sales of the Snapdragon 810 as it can before demand wanes for that SoC. The Snapdragon 810 is currently found on such recent phones as the LG G Flex 2 and the HTC One M9. You will also find the Snapdragon 810 SoC inside the LG G4, Sony Xperia Z4 and the Xiaomi Mi Note Pro once those models are released later this year. To me it seems that phones, chips etc have plateaued. It's just little incremental updates now rather than huge advances. Maybe they should get the finger out and bring us batteries that last a week or more on a charge..
and to be honest processors are really capable of the tasks one demands from a smartphone (except games with high graphic demans). I'm pretty happy with snapdragon 800 on my Nexus 5. we need power consumption optimization on SoC side and better capacities per unit of volume in battery department. Higher performance is always welcomed but it's not the first priority anymore. Battery longevity is more important than thinnest of the phone and quad HD. 815 cannot come to soon! Given the overheating issues with 810. Personally, i would wait to buy a 815 phone and skip on the current gen of 810 phones. Unless, you change phones every couple of months, it's best to wait and get a phone that won't burn your hands or through your pockets if you use it for gaming or other intensive tasks. Exactly. We need the "haswell" and "broadwell" movement where the chips consume drastically less power and still mantain great performance through more advanced manufacturing processes and smaller die sizes. Get to where you have an efficient chip that can last longer off a smaller capacity battery that charges faster. Kind of like the Galaxy S6 seems to be doing. Same thing goes for you, do some research. Cortex A72's architechture only uses a little less (~15%) power under the same load than A57. It's the node size, 16nm for A72 and 20nm for A57, that makes the difference. I also doubt that a A72 core on 16nm will be much more efficient than a A57 core on 14nm. And how much more efficient than Haswell is Broadwell on the same node? Oh wait.. True that. Unfortunately and apparently, battery charging speed and thinness matters more than larger or more compressed batteries. We'll have to bank on die shrinks (which happen too slowly), more efficient displays (sadly, very few OEMS can afford to innovate in display technology), better microarchitectures (only Apple can afford to make new microarchitectures but battery life as a result is a different story) and more efficient components. Uhh, anyone can make new microarchitectures. It's not hard or expensive. Hell, Huawei is doing it. Node process is more important, not the architecture. The Kirin 930 is not confirmed to use Cortex A53s modified by Huawei itself. It was increasing because they were really far behind, but now that they have catched up with current tecnology they cant no longer make big jumps..
Hmm actually if you think about it the limited battery tech currently help push the cpu tech improvement. and other things like RAM, storage, and display efficiency. tell that to Samsung lol. and new battery tech is just around the corner. They quickly need to put out this processor so that people can forget the fiasco they call the SD 810. Hopefully the Moto X 2015 will feature this processor as it's released later in the year. That'll be my next phone unless Lenovo ruins it. Yup. I too am waiting for the 2016 Moto X and what it brings to the table. I don't have too high hopes for the camera though even though really want it to be great. That seems be only Samsung and Sony's forte. You're waiting for the 2016 model??? You must have the 2014 Moto X then. my contract is up in February so I might get the 2015 after it's been out for a short period, or wait a few more months for the 16 as well. It all boils down to my will power to buy the phone two generations better than my current model or the common sense to hold out for the next best thing. As for the camera, Motorola is getting progressively better and better in that department. By the time the 2016 comes to the market, there should be no excuse for people to complain about the image quality. It's their batteries that I hope see a dramatic boost by then. If Motorola doesn't fix the camera I'm skipping the Moto X this year. I heard that the new exynos can operate 8 cores simultaneously. So can the 810 and this 815. But most of the time it will resort using the 4 larger ones or 4 smaller ones, depending on the weight of the task. The small ones are much easier on the battery, the large ones the powerhouses. And when the going gets tough, all 8 are put to work. That is indeed what the article suggests and that is a false suggestion. Since all these SoC's are based on ARM designs with HMP (8 cores simultaneously) option built in. You don't seem to understand the concept, you don't want to be using the A15/A57/A72 all the time because they use a lot of power - that is why they put the weaker cores in. big.Little. Is great for how the chips are right now. Since we haven't gotten to where the proper cores are incredibly power efficient yet, 8 full cores would be powerful for sure, but the battery life would be abysmal. The LITTLE cores are slower clocked to handle the small processes like basic web browsing and navigating the UI and then the big cores activate for more power intensive processes. It works great IMO. Is this based on the 20 nm or the 14 nm process?